All of us travel very frequently to different places, sometimes to enjoy and sometimes for work and projects. But what’s common between both of them is the luggage you carry. Your clothes, footwear, underwear and some daily needs are always with you on your tour; no matter you are traveling for a week or two. And I’m damn sure you are looking for the best lightweight suitcase for your travel, voila my friend you are at the right place. We have got one of the best suitcases for you and here’s the full in-depth review of Samsonite Winfield 2 spinner with all pros and cons. It’s sturdy design and great features make it one of the best choices for you. With the spinner style case, it becomes easy to move around and its unique design adds a charm to this suitcase and that’s what makes it awesome. This suitcase uses the most popular design in the modern world, clamshell design that means it becomes easy to pack everything as it opens completely in two halves. The internal is covered with a simple nylon lining and gives you access to all parts and sections of the suitcase from a single open. The bottom section has a side pocket (zippered type) to store some small items like toothbrush and toothpaste. Also, it has elastic straps to keep the items in a proper manner and keep them steady without being untidy. First of all, it has a full mesh cover that is just perfect for keeping everything is a tidy form. Secondly, it has a couple of two pockets on the cover. It becomes really handy when you need a comb or something like that quickly without being opening the main section of the case. So with these types of zips, it becomes easy to keep everything in a proper way, like all heavier and larger items on the bottom and lighter items on the top. Besides all this, it has an expander zipper along the side of the case so that you can use extra inches for keeping extra items. 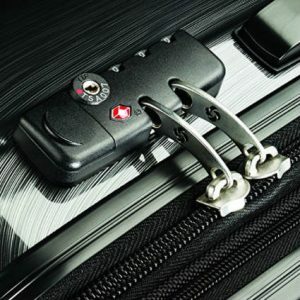 It’s just very simple to use this feature, expand the zip, close it and then again close it to compress the luggage. 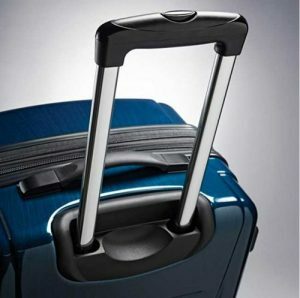 Samsonite Winfield 2 comes with a durable metal telescopic handle to help you push and pull it accordingly with ease. The main struts are made from aluminum and the handle is nicely build and fitted in the struts to make it easy and comfortable to hold. The push button in the middle makes it easy for you move the handle up and down. Besides this, you also get two extra handles, one at the top and the other at the side of the suitcase to easily pull and push it under the trunk of a car or put it under your seat in a train. The Winfield 2 comes with a TSA approved lock, not the most secured lock in the market but it can satisfy you with other features. It is a kind of numbered combination lock, so you don’t need to bother about those keys that you lose easily. As it is attached to the case itself, you don’t need to carry a separate lock. The only con of this lock is that you might sometimes find it a little difficult to put those zippers into such locks and this is not the most secured lock in the market. I still carry a separate lock because as I had told you earlier the stock lock doesn’t prove to be very good always. Spinners need to have great grip and should be flexible so that you can easily rely on them to move on its own. You can check out the reviews on Amazon Global Stores, they have said that the wheels are just awesome and work very well. So I would Samsonite has done a great job for Winfield 2. You do not expect anything to last a lifetime but this fancy looking case is very well built. You won’t regret the sturdiness on this suitcase. You probably won’t find such a sturdy suitcase for this price range. Also, it comes with extra zippers so in case the stock ones are worn out or broken you can always replace it with a similar looking zipper with ease. In this way, you would never lose the stylish look of Samsonite Winfield 2. The suitcase is extremely light in weight. You won’t feel much weight on your arms. The nylon lining inside the case is light in weight and sturdy as well. So this won’t feel much heavy even when you have occupied all the volume inside. The Winfield 2 spinner bag is water resistant as well. I went on a trip and it was raining like hell if it would have been some other bag all my clothes and accessories would have been damaged but this case saved me. That day I realized that this is not only fancy looking but functional as well. Just like me, you would be tired of those black and green suitcases. But wait because this suitcase has some unique color choices for you. All the four colors (Charcoal, Orange, Deep Blue, and Purple) in which it is available just look amazing. You won’t regret any of them. Most of the people have only black suitcase so it becomes difficult to find yours. But with its unique colors, you can easily spot the bag in the sack of too many bags. You would wonder at first look that it has some plastic coating, but believe me, it does not have anything like that. Incredibly light suitcase and easy to move around. 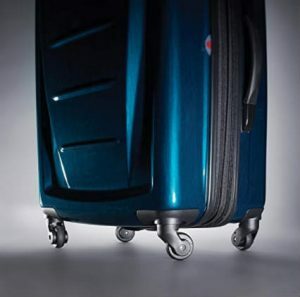 Get compliments on every trip with Samsonite 24-inch spinner. The smooth surface makes it easy to slide across. It seems to get scratches easily. You might sometimes find it a little difficult to put those zippers into the lock provided. Is it a hard outer case bag? Yes! Of course, it is a well-designed and well-built suitcase from a reliable brand, Samsonite. Is it a carry-on bag? Yes! Samsonite is a reliable brand. Does this bag have a plastic coating on the outer case? Nope! Winfield 2 does not have any kind of plastic coating on the outer surface. Although there are too many bags available in the market but mark my words that you won't regret the Samsonite Winfield 2. 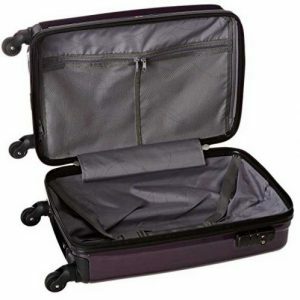 It is for those who really want a sturdy looking suitcase with clamshell and well-built design. Samsonite had covered almost all the features for making it a perfect suitcase: TSA lock, mesh pockets, clamshell design, expandable zipper, and strong case polycarbonate material, thin nylon lining in the interior and much more. So this would really last longer than you think it could. Don't forget to check it out and do let us know in the comment how you liked this suitcase. If you are going to purchase the Samsonite Winfield 2 then share your personal experience with us in the comment section below. Happy Travelling.